If you are a carrot fan, this is your dish. After my wonderful trip to Portland, I came back very inspired. This is a Portland inspired dish, that I ate at Coquine restaurant. Basically, there were three kinds of carrots in three different textures: a puree, roasted and shaved. So I decided to reproduce something similar which turned out quite delicious. 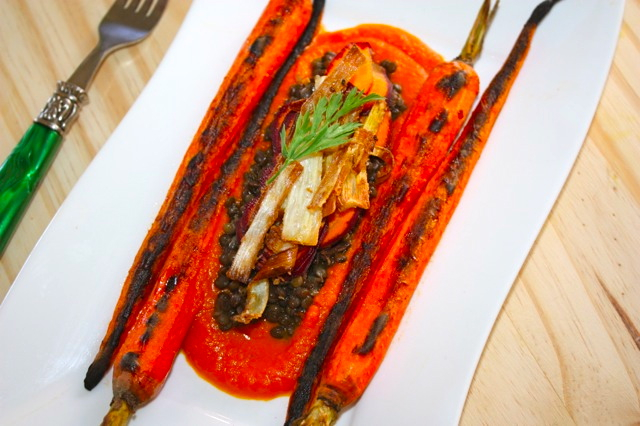 I love the deep orange color of the dish and the very different carrot textures and flavors. It is a vegan dish, so one of those “make-you-feel-clean-meal”, at least that’s how I feel. This dish is very well balanced in terms of textures and flavors. 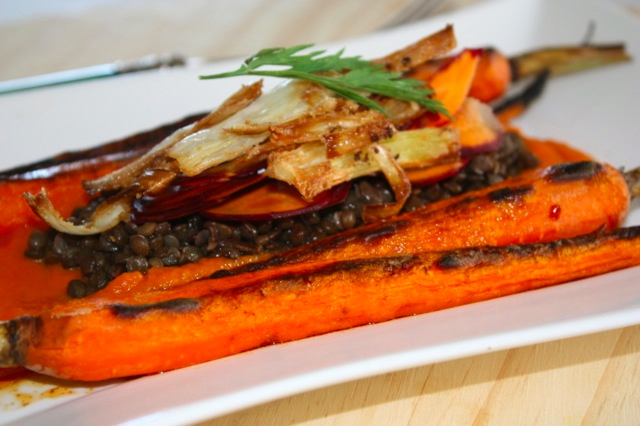 The smoothness of the puree contrasts with the sweet crunchiness of the fried leeks and soft lentils. In France we have a saying “les carottes, ça rend aimable” (carrots make you pleasant), which I don’t know where it comes from, so today I have to say that I am extremely pleasant, especially that I ate two portions instead of one. There are many different steps in this recipe but fast steps, so it’s not too time consuming. Using a mandoline, slice carrots very finely. In a small bowl, mix oil, paprika, cumin powder, honey, salt and pepper. Coat the carrots with the mixture and broil under broiler until carrots are golden brown. Place carrots in a pot with broth and let cook until carrots are tender. You might need to add broth if not enough during cooking process. When carrots are cooked, place in a mixer and mix until smooth consistency. Add all the other ingredients. Keep warm. Wash lentils. Cook lentils in a pot of water with all other ingredients. When lentils are cooked, drain and add olive oil and salt. Heat oil in a pan. Mix flour and corn starch. Coat leeks with mixture. 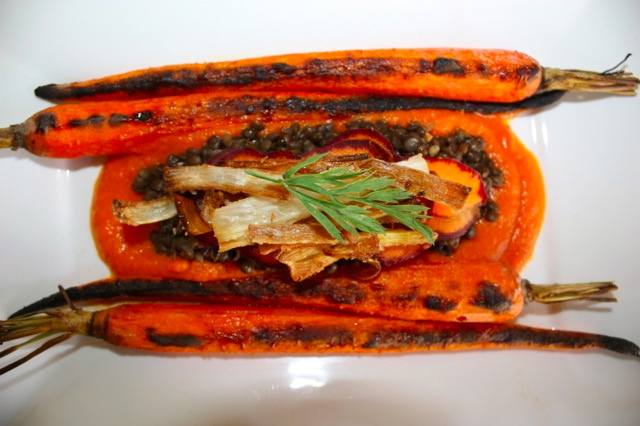 Place some purée first on bottom of the plate, add lentils, divide roasted carrots on the plate. Top it with sliced carrots and fried leeks. This entry was posted by silvia on October 20, 2016 at 4:12 am, and is filed under Misc recipes, Vegan, Vegetables. Follow any responses to this post through RSS 2.0.You can leave a response or trackback from your own site.